↑ Ramusack 2004, পৃ. 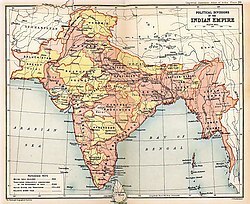 87 Quote: "The British system of indirect rule over Indian states ... provided a model for the efficient use of scarce monetary and personnel resources that could be adopted to imperial acquisitions in Malaya and Africa. (p. 87)"